Motherwell put 13 past Hutchison Vale as Hearts narrowly lose to rivals Hibernian. SWPL 2 title favourites Heart of Midlothian narrowly lost to Hibernian, Celtic put seven past Dundee United, Hamilton Academical lost 4–0 to Spartans, Glasgow City scored nine at McDiarmid Park, Motherwell won 13–0 over Hutchison Vale, Abby Callaghan scored the 80th-minute winner in Stirling University's 2–1 victory against Glasgow Girls, Partick Thistle lost 4–0 to Rangers, while F.C. Kilmarnock lost 2–1 to Forfar Farmington. Rangers proved to be too strong for the newly-promoted home side, despite an improved second-half performance. Holly Napier got her second goal in two games in the 5th minute, when she headed in a cross from Amy Muir. Rangers doubled their lead in the 18th minute through Carla Boyce, who collected Clare Gemmell's pass and slotted home after a defensive mistake by Joanne Addie. Chelsie Watson made it 3–0 in the 24th minute, when she headed home from Ellis Dalgliesh's corner. Boyce scored again in the 40th minute, when Scotland U17 international Laura McCartney found space to cross on the right and picked out Boyce, who volleyed home from close range. Because Thistle did not have a goalkeeper on the bench, they were forced to replace the injured Nicolle Andrews with forward Mhairi Hawksworth in the 60th minute; however, no more goals were scored in the second half. After a goalless first half, the home side broke the deadlock in the 51st minute, when Beth McPherson slipped the ball through to Cheryl Kilcoyne and the forward made some space for herself before slotting home. Four minutes later, Danni McGinley made it 2–0, when Kilmarnock failed to clear a Nicola Davidson cross and McGinley volleyed the ball home past the visitors' goalkeeper. Samantha Hare pulled one back for Kilmarnock in the 84th minute, when she bundled home a Lisa Swanson cross, and Swanson almost got on the scoresheet herself in the 89th minute, but her free-kick was saved by Fiona McNicoll. Promotion favourites Heart of Midlothian, who lost 4–0 to Hibernian last season, put up a fight against last year's SWPL Cup winners, but they were unable to trouble the Hibernian defence. The home side, who dominated possession throughout, had a couple of chances to take the lead in the opening minutes of the first half, including two opportunities from Siobhan Hunter and Amy Gallacher, but failed to capitalise. The game-winning goal came in the 38th minute, when Kirsten Reilly's long-range effort found the back of the net. The hosts had many chances to score another goal in the second half, but the Hearts defence managed to keep the scoreline at 1–0. Hutchison Vale, who lost 9–0 to Hearts last week, suffered another huge defeat on Sunday, as they were hammered 13–0 at home by Motherwell. Katie Rice, who opened the scoring in the 1st minute, grabbed her second goal in the 29th minute. 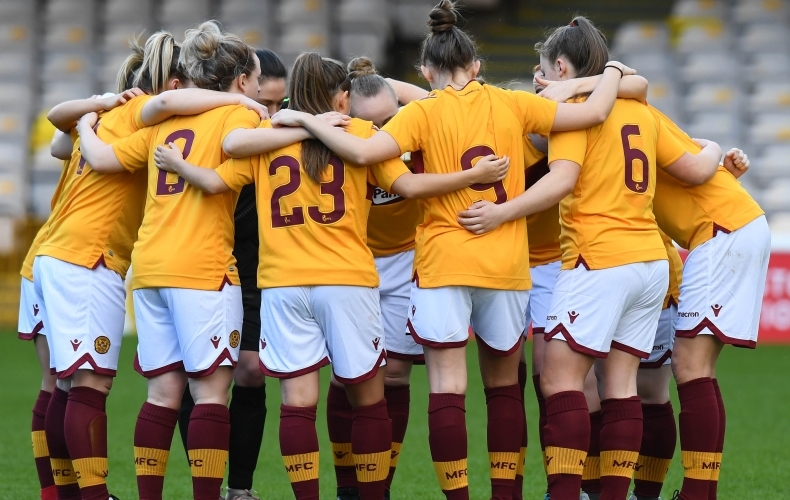 Lori Gardner got on the scoresheet in the 17th minute, Mhairi Fyfe scored three penalties, and Motherwell went into the break with a more-than-comfortable 6–0 lead. Caitlin Russell then scored from close range in the 48th minute, Gardner grabbed her second of the game in the 59th minute, and a few minutes later Fyfe made it 9–0 to the visitors. Scotland U17 international Chelsea McEachran scored twice and Russell found the back of the net again, before Gardner finally got her hat-trick in the 85th minute. After a goalless first half, the visitors broke the deadlock in the 55th minute through Tegan Reynolds, and four minutes later they had the ball in the back of the net again, but their effort was flagged for offside. Louise Mason made it 2–0 in the 68th minute with a long-distance effort, and second-half substitute Beth Mackay scored in the 81st and 85th minutes to put the match out of Hamilton's reach. Ciara Bonner broke the deadlock for Stirling University in the 15th minute with a corner-kick goal, but Glasgow Girls equalised in the 55th minute through Lucy McEwan, who found the back of the net from outside the box. However, Scotland U19 international Abby Callaghan prevented the match from going into extra-time by finding the back of the net in the 80th minute. Glasgow City shot into a two-goal lead in no time at all, with Hayley Lauder scoring twice in the opening ten minutes. Nicola Docherty then made it three in the 24th minute with a cross that found the back of the net and, after a few quiet minutes, Lauder got her hat-trick. Kirsty Howat then made it 5–0 in the 41st minute with a lob over the goalkeeper, and the SWPL 1 side went into the break with a comfortable lead. Howat scored her second of the match in the 66th minute, and two minutes later Jenna Clark headed home a Leanne Ross corner. Samantha Kerr then made it 8–0 to the visitors in the 79th minute, and ten minutes later Howat – who has now scored six goals in just two games – completed her hat-trick to make it 9 for City. Scotland U17 international Kathleen McGovern broke the deadlock for Celtic in the 9th minute, after Sarah Ewens' lob came back off the bar. The Hoops doubled their lead in the 29th minute, when Keeva Keenan chased a long ball down the left wing before whipping in a low cross in the direction of McGovern, who coolly slotted home. Claire Crosbie extended the visitors' lead in the 41st minute, when she headed home from Kirsty McLaughlin's corner. Celtic continued to dominate in the second half; Ewens made it 4–0 in the 46th minute, when she collected Emma Black's pass and lobbed the ball over Aaliyah-Jay Meach. McGovern got her hat-trick in the 75th minute, when she volleyed home a brilliant ball in from Katherine Smart. McLaughlin got on the scoresheet in the 80th minute, and not even a minute later Crosbie headed home again from another McLaughlin corner, making it 7–0 to Celtic. The quarter-final draw will take place on Wednesday, 27 February 2019.